Battle Still Brews In La Trobe University HUSS Cuts Debate. The last few months has seen a renaissance of protesting, sit-ins and political unrest at la Trobe University in response to 500 plus proposed cuts to the humanities and social science faculties. The students are concerned about the university’s plans to cut 45 academic staff jobs and 500 subjects from its humanities and social science departments due to depleted enrolment. The university announced the plans in a document released June 20 with Humanities and Social Science Dean, Tim Murray declaring a final decision will be made sometime this month. Since hearing of the news students have partaken in overnight occupations of their university grounds, protests, marches and a series of petitions to combat these changes. Under the threat of expulsion and weeks of peaceful protests, the raging debate reached a tension filled apex as the Stop HUSS Cuts Collective and Occupy La Trobe grew forceful in their frustrations. Escalating from peaceful to pushy, a La Trobe University Professor was forced to use an underground network to escape the student’s wrath. 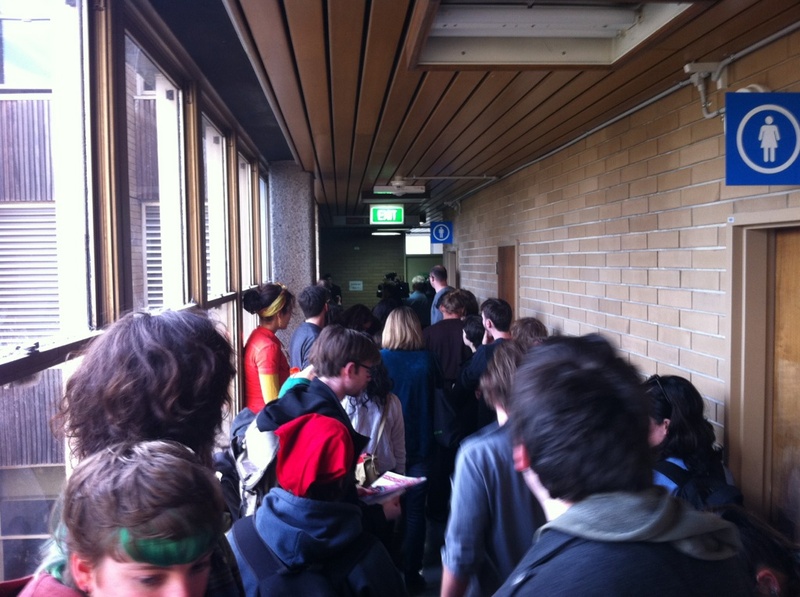 Vice Chancellor, Professor John Dewar was ushered into a room by security staff during La Trobe’s annual Open Day when students protesting against proposed cuts confronted and reportedly hounded him into a building at the university’s Bundoora campus. Since this time significant changes have been made to the proposal including a decline in the number subject and staff redundancies. As it stands La Trobe University are planning to cut 37 jobs by the end of this year along with the dismissal of 370 subjects. La Trobe University Professor John Dewar released a statement on the reviewed proposal late last month. “We may all wish it were otherwise, but we must recognise that traditional arts degrees are no longer sufficiently enticing nor relevant to school leavers and employers alike, and students have been voting, in effect, for a smaller humanities faculty with their feet.” He stated. Morgan Cummings, a third year arts student at La Trobe University and student union representative believes the battle is far from over. Morgan took the time to answer a few questions about the future of the movement. With a final decision still looming on what will come from the tireless protests and student efforts, Occupy Latrobe have implored the university to enter into negotiations with the National Tertiary Education Union in good faith, to create a shift in focus from saving money to saving jobs and for a redistribution of executive pay to save other jobs at the university. 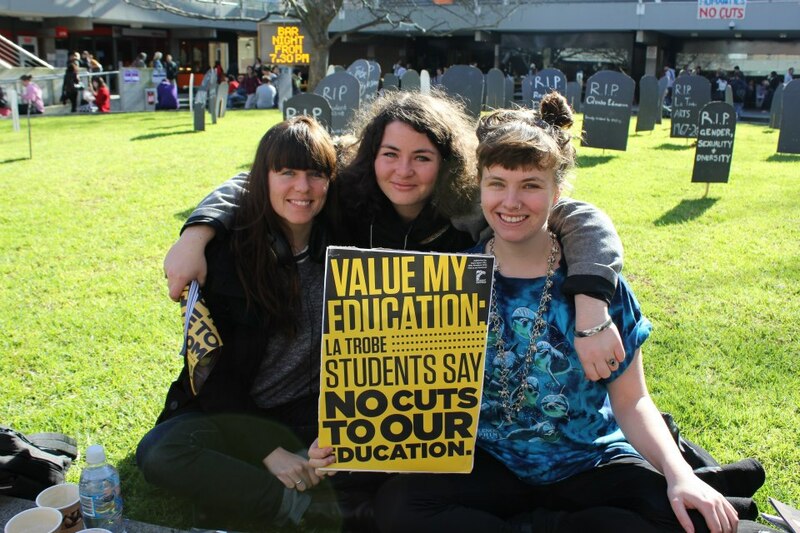 Grace Stevens, Madeleine Gray and Caitlyn Kelly pictured at the La Trobe Agora showing support for the No Cuts protest. Madeleine Gray (pictured above), a third year International Relations student at La Trobe University and active member of Stop Huss Cuts considers this to be a positive step forward in the ongoing movement but one that still has far to go in ensuring their beloved institution is maintained. With negotiations still surging it will be some time before the impassioned students and staff of La Trobe University receives final word on the proposed cuts. For the students and faculty members this will be a fight not soon to slow down. A protest against “Innocence of Muslims” – a 14-minute video posted on YouTube, was initially planned Sunday 23. September, but got cancelled by the organiser over fears that the event could spark the kind of violence that erupted between police and Muslim protesters in Sydney. 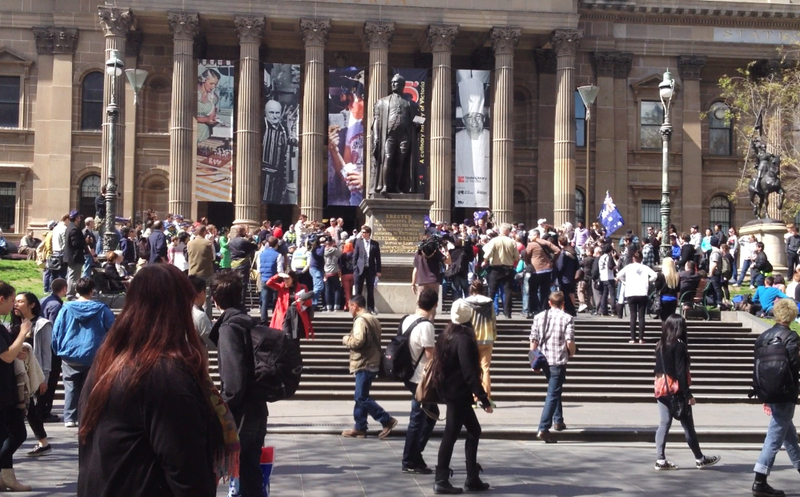 An argument erupted on the steps of the State Library of Victoria. It was calm in front of the Victorian State Library, site of a cancelled Islamic rally, before four men wearing “proudly atheist” T-shirts and carrying signs saying “Islam is false” came. A passing Sydney-living man was drawn into a debate with the atheists over the content of their signs when he asked them to take them down. There was no physical violence, but tensions escalated as the young men draped in Australian flags got involved. The group of men, some with SS insignia and some with shaved heads, had been waiting at the library for a couple of hours. They denied being part of any organisation, and said they only came there to enjoy the nice weather. The arguments lasted for about 20 minutes when the police asked the pro-Muslim man if he could leave before things got out of control. 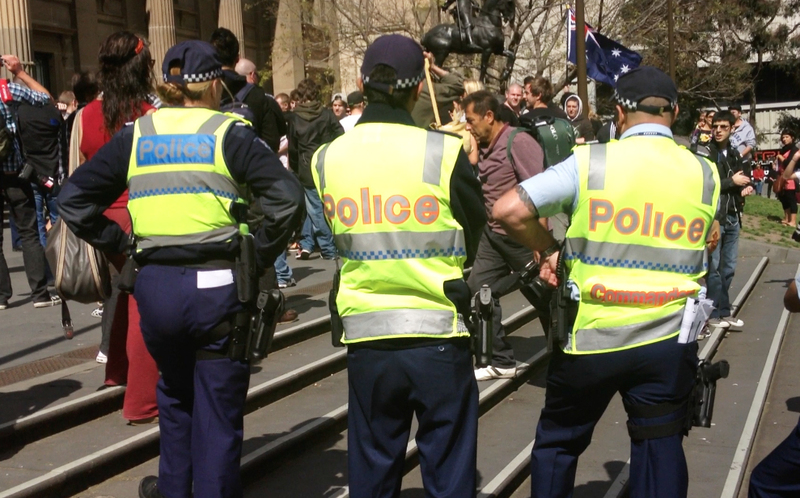 The Victoria Police was prepared for the worst, but said it was a peaceful argument. Ending with the nationalist protesters waving the Australian flags and chanting “Aussie Aussie Aussie, Oi Oi Oi” and “we grew here they flew here”. Police also said that they didn’t know if the group of men with SS insignia were in any particular group, but the police knew some of them. The video denigrating the Prophet Muhammad, made by a US-based filmmaker, has incited violent rallies around the world. And the violent protest in Sydney, resulted in 17 people injured. The video has now more than 13,5 million hits. Australian for Syria rally aims to draw attention to the unstable situation in Syria recently.